The company unofficially launched What’s Funny About Climate Change? 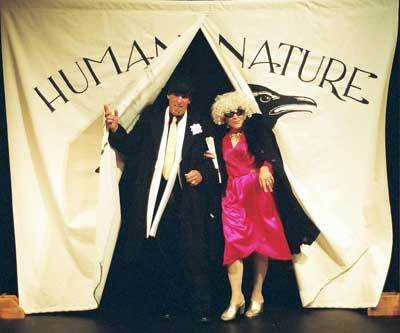 with a draft version performed at the annual Cities for Climate Protection conference in Seattle in the late winter of 2002. It was there, as part of a solicited entertainment, that we first undertook the task of finding humor amidst the pathos and pathologies of a species and a society seemingly determined to burn its house down. We continued performing on and off until May, 2005. Altogether, including soiree living room performances, college and university shows, performances in theaters, community centers or churches, those specifically produced for high school and youth audiences we performed 100 shows for a total audience approaching 20,000. The mission of warning and inspiring the world, or whatever part of it we could lure to the theater, was clearly both Quixotic and absolutely necessary. Given that our company’s history was one of dealing theatrically with crucial concerns of the environment, economy and society, this issue was hard to ignore. The trick, we figured from the outset, was to find a means—a style, a theatrical idiom—that could both disarm audiences and force them to confront the issue at the same time. It was a considerable challenge to craft and conceptualization. People in the U.S. and elsewhere have not been eager to confront the range of difficulties and challenges climate change portends. For many Americans, ignoring the issue has seemed the only healthy response. What was one supposed to do about it? These hesitancies have helped make it possible for the coal, oil and gas industries, in collusion with the Federal government over the last five years, to obfuscate and deny with consistent success. As long as a small seed of doubt could be caste on the science of climate change or on humans’ role in it, people would gladly cling to the energy status quo and ignore the necessity for significant behavioral changes. Besides, the kind of scenarios that rise in the imagination once one accepts the basic truth of the phenomenon of climate change are, to many, simply inadmissible.